TOKI: A Radiant New You in 45 days. Toki Collagen is a lemon flavoured supplement that was developed to provide absorbable collagen and essential nutrients to the deep layer in the skin. Clinically tested for wrinkles, age spots, hydration and natural radiance. Toki is available in powdered drink or tablet form or at our clinic. Fighting the Signs of Ageing Beauty experts know that our bodies produce less collagen as we age. That can lead to fine lines, age spots and dry, tired looking skin. The challenge has always been how to restore collagen levels, especially in the critical, deep layer of the skin. Most creams and lotions only penetrate the upper skin layer. Then, a new, different collagen drink called TOKI, offered the promise of porcelain skin from within. TOKI, developed in Japan, appeared to do what other skin products, including other collagen supplements could not, helped to restore deep layer collagen levels. As a result a growing number of men and women, of all ages, have made TOKI part of their daily lives. Many have seen TOKI continually diminish wrinkles and age spots while enhancing overall skin glow, hydration and tone. Collagen to the Dermis TOKI, a natural lemon citrus drink, was developed to provide absorbable collagen and essential nutrients to the deep layer in the skin. It is composed of patented Collagen peptide, Vitamin C (ascorbic acid), Calcium (calcium oxide and calcium hydroxide) Glucosamine, HA (Hyaluronic Acid) and Dermantic Acid (Muccopolysaccharide Complex) and HAI (Heated Algae Ingredient). This collagen formula is water soluble and highly absorbable. The HAI which contains approximately 47 amino acids may facilitate absorption of the collagen. TOKI powder, mixed in eight ounce of water, delivers all of these essential nutrients to the dermis, traveling through the bloodstream, to bring nourishment to cells deep down where topical applications cannot reach. Like water from an underground spring, the nutrients in TOKI are absorbed into the dermis and parched cells begin springing back to life. TOKI nourishes and replenishes from within. Clinically Tested For Wrinkles and Age Spots TOKI was the subject of an eight-week-long clinical study of 32 women between the ages of 35 and 65. The study results were published in the Journal of the American Nutraceutical Association (JANA) in 2002. Each woman was evaluated every two weeks for improvement in the soft tissue of the eyes, sagging, puffiness, wrinkles, and overall facial aging through a visual assessment scale, dermatological exams, and patient self-evaluations. Blood collagen levels were also tested during the first four weeks of the study. * The dermatological review found statistically significant improvements in the soft tissue of the eyes, sagging, puffiness, wrinkling, and aging over the course of eight weeks. Patients saw improvements in their appearance and on average, blood collagen indicators increased by 114%. In addition Medical professionals are finding that TOKI is useful as an adjunct to other forms of cosmetic treatment. Sylvan Bartlett, M.D. of Midland TX started patients who have deep scars on TOKI the same day they have laser resurfacing. Porcelain Skin From Within TOKI reintroduces a youthful look and feel to skin with an extraordinary ingredient base that includes Collagen Peptide and Vitamin C to restore a more youthful quality to the skin. That is combined with the moisture retention of Hyaluronic Acid in a mucopolysaccharide complex. When all these ingredients are modified with HAI Amino Acid Extract from Hijiki seaweed for enhanced absorption, skin tone, moisture level and resiliency are revived. In as little as 45 days, skin texture starts to become smoother and tighter, hydration and radiance improve and the appearance of fine lines and wrinkles may be diminished. Toki is available in convenient single packets powder form or mini-tabs. 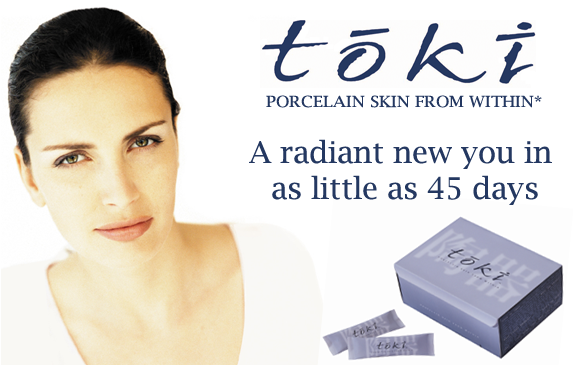 Toki contains Active Collagen, Calcium, and Hyaluronic & Dermatanic acids. These nutrients have been combined with 47 amino acids from Hijiki seaweed to promote absorption. Unlike topical creams, Toki supports internally. The consumption of dietary collagen formulation (Toki) resulted in highly statistically significant improvement in periorbital wrinkling, in periorbital aging and in periorbital overall facial aging. The investigator’s mean global improvement scores of overall facial aging as compared to baseline photographs were highly significant. * In women with age-related skin changes, a dietary collagen formulation (Toki) from LaneLabs significantly improved periorbital wrinkling, periorbital aging, and periorbital overall facial aging with minimal adverse effects. * Dermatological Examinations from a 60-day clinical study of 40 Toki users (led by the Director of Dermatology at Research Testing Laboratories, New York.) rated 78% of women as “improved” or “much improved” on his global assessment including: radiance, appearance of fine lines and wrinkles and lightening of patchy discolorations such as age spots. The Science of Toki The skin is divided in 2 main portions; the upper layer is the Epidermis and the lower layer is the Dermis. The bottom layer of the Epidermis is where pigment-producing cells live (melanocytes), where our skin color is produced as well as less desirable skin tones and overall skin discolorations (freckles, dark spots). These can also be due to sun damage. STUDY 3: SKIN IMPEDENCE AND JOINT HEALTH Researchers at Katsuragi Hospital in Japan discovered skin improvements in people who ingested Toki (described as AAACa calcium with collagen and other matrix components). In this 80 person case controlled study, changes were measured between an individual taking Toki and a similar subject who took nothing. The researchers noted that “basal skin impedance, which increases with age, was significantly reduced in response to the Ca-collagen matrix [i.e. Toki] supplementation, suggesting a change in skin properties similar to rejuvenation, along with subjective smoothening and moistening of the skin. “LaneLabs Toki is a collagen drink that helps diminish the signs of aging and improves skin texture.”* Read full article –Skin Inc.